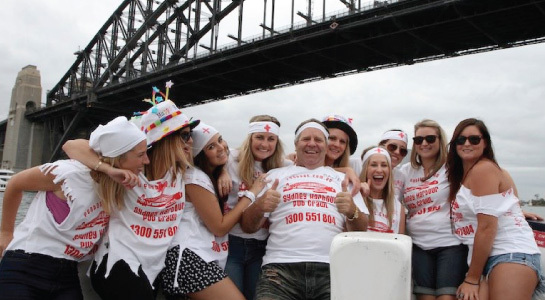 The Famous Sydney Harbour Pub-crawl is back, by popular demand! Established in 2009, this Sydney Harbour event is available for Social clubs, Hens, Bucks, Birthdays and even Fun Loving Seniors. This day, is a combination of cruising Sydney Harbour, great food, great music and fun loving fellow passengers. The "Funboat" pulls up at the Historical Rocks with patrons being escorted to several pubs in the Rocks precinct for a visit. Then it is back on board the "Funboat" to continue a fantastic cruise with great music and interactive entertainment. This is a complete afternoon of entertainment, combining with the best harbour in the world and a fun tour of The Rocks visiting the famous watering holes. Everyone on board receive a souvenir "Pub-crawl T-Shirt" and everyone on board who arrive as strangers will establish new friendships. The cruise departs King Street Wharf at Midday and returns at around 430pm. 4.5 hrs cruise on our "Funboat"
Please Note - these days are NOT a drinking session. Our 4.5 hr cruise is combined with food, entertainment and beverages. The vessel crew and hotels, will NOT tolerate any antisocial, disorderly or alcohol abuse. No BYO, both vessel and pubs are licensed premisses and strict RSA rules are enforced. Route and pubs are an indication only and can be changed without notice. Numbers are limited to 70 passengers per cruise. All passengers MUST be over the age of 18yrs and carry photo ID. Pretty much anyone who's looking for a fun day out on the Harbour! Please Note: The ticket price does not include any beverages either on-board or at the pubs. The Funboat has a fully licensed bar on-board that stocks beers, wines, spirits and soft drinks at competitive prices. There is strictly NO BYO.